This online course addresses the fundamentals of adult weight management. This online course consists of 10 modules and has been awarded thirty-eight (38) CPEs. To place an order by telephone with a credit card (American Express, VISA, MasterCard or Discover), call 312-899-0040, ext 5000 and reference the product number SSOIA18. 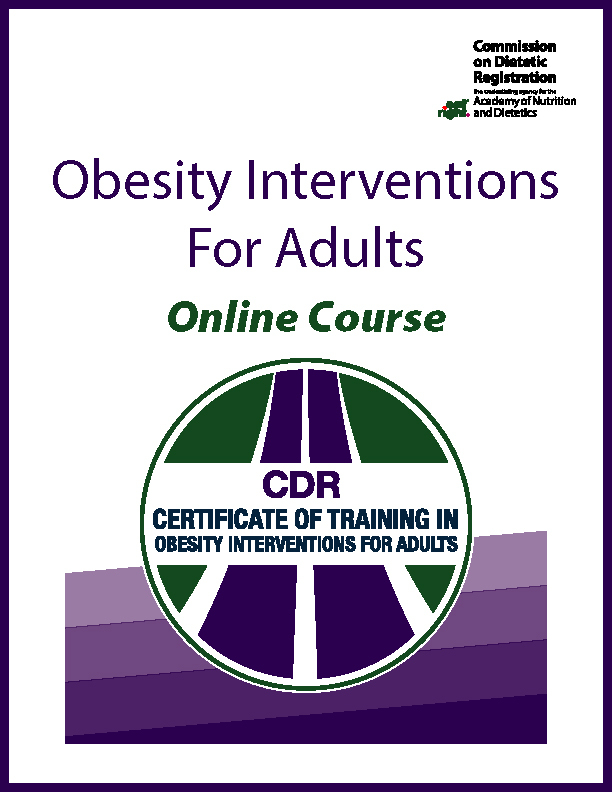 This online course fulfills the pre-work and assessment test prerequisite requirements for a Certificate of Training in Obesity Interventions for Adults program that will be offered through June 30, 2019. The online module can be purchased in bulk. Only one RD, RDN, DTR or NDTR will be awarded CPE hours per module. Please contact CDR at 1/800-877-1600 ext 4783 to purchase a bulk order.